We've said it before, but there's more proof - gamers are Great Mean too. 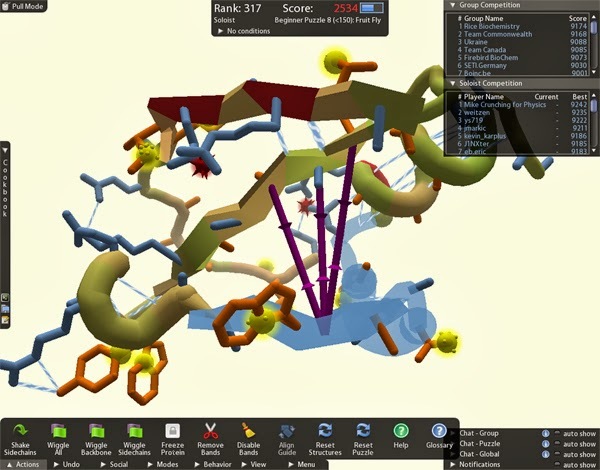 In a novel form of crowdsourcing - using usually free services of many, often hundreds or thousands, people typically via an online tool to solve problems - people playing a game have plotted the intricate structure of the M-PMV retroviral protein, an enzyme that plays a key role in the development of a virus similar to HIV in ten days when scientists have been unable to do it in a decade. Though computers had been used before, they lack the spatial recognition and creativity of human beings and the code could not be cracked. In what was essentially a last-ditch effort by Firas Khatib, a biochemist at the University of Washington, they posted the HIV protein on Foldit and let gamers have at it, and oh did they, cracking it in ten days. The cool thing is that this can be used in the future. In generic and specific instances, games like Foldit - and other crowdsourcing tools - can help us solve many problems that we could never do before with a few people, even armed with the most powerful computers, could never do before.